As of this writing there is still at least 6 inches of snow as I look out the window. It is hard to believe that just a year ago it was 80F! Despite the cold and snowy conditions now, we will be right in the middle of spring in a month or so. With that said, now is a good time to begin preparing for management of your winter wheat crop for diseases. While the decisions about tillage and resistant varieties have already been made for the 2013 wheat crop in Wisconsin, there are an increasing number of fungicides available for in-season management of winter wheat diseases. The decision to apply a fungicide shouldn’t be taken lightly and you should scout diligently and weigh all options prior to choosing to apply a fungicide. In Wisconsin, the primary disease of concern will be powdery mildew. However, leaf blotches, Fusarium head scab and rusts can be of important yield-robbing diseases in some years. For example, in 2012 stripe rust was prevalent on moderately susceptible varieties of winter wheat grown in Wisconsin. Scouting for powdery mildew and leaf blotches should commence even while plants are in the late-tiller stages (Feekes growth stage 4 and 5; April in most years in Wisconsin) and tracked regularly. On varieties highly susceptible to powdery mildew and in years when weather is favorable (cool temperatures; 50 – 70F and high humidity) resulting in high powdery mildew pressure, an application of fungicide tank-mixed with the spring herbicide application might be warranted. Other diseases like rust may show up later during the stem elongation growth stages (Feekes 6-10). Applications of fungicide might be warranted to manage rust if the variety is highly susceptible, weather conditions are favorable for rust development, and scouting reveals high severity especially near flag leaf emergence (Feekes 8). All rusts (stripe rust, leaf rust, and stem rust) are favored by wet weather and periods of extended leaf wetness. However, temperature optimums vary among the different rusts. Stripe rust is favored during periods when temperatures are between 55 and 65F, while leaf rust tends to occur at a higher temperature range of 60 to 72F. Stem rust tends to occur at temperatures between 60 and 104F. In most years, spores of the rust pathogens will not readily overwinter in Wisconsin. Cold temperatures (<32 F) will reduce the ability of rust to overwinter. Spores are typically carried into Wisconsin on wind currents from southern states. In years like 2012 where the winter was mild, it is likely that rust pathogens were able to overwinter on wheat debris in Wisconsin. This could be one reason for the unusually high incidence and severity of stripe rust observed in 2012 in Wisconsin. Fusarium head blight (FHB; a.k.a Fusarium head scab) is a disease of concern during the heading growth stage of wheat (Feekes 10 and later). Severe FHB can result in high levels of the mycotoxin deoxynivalenol (DON or vomitoxin). Dockage at the elevator can occur if a load of wheat grain tests positive for DON at levels above 2ppm. Therefore, managing FHB can be important in areas with a history of the disease and where susceptible varieties are grown. Decisions to apply a fungicide to manage FHB should be made at Feekes 10.5 (early flowering). A web-based tool is available that assists crop managers in making a decision to apply a fungicide based on weather inputs over the 7-day period prior to flowering. 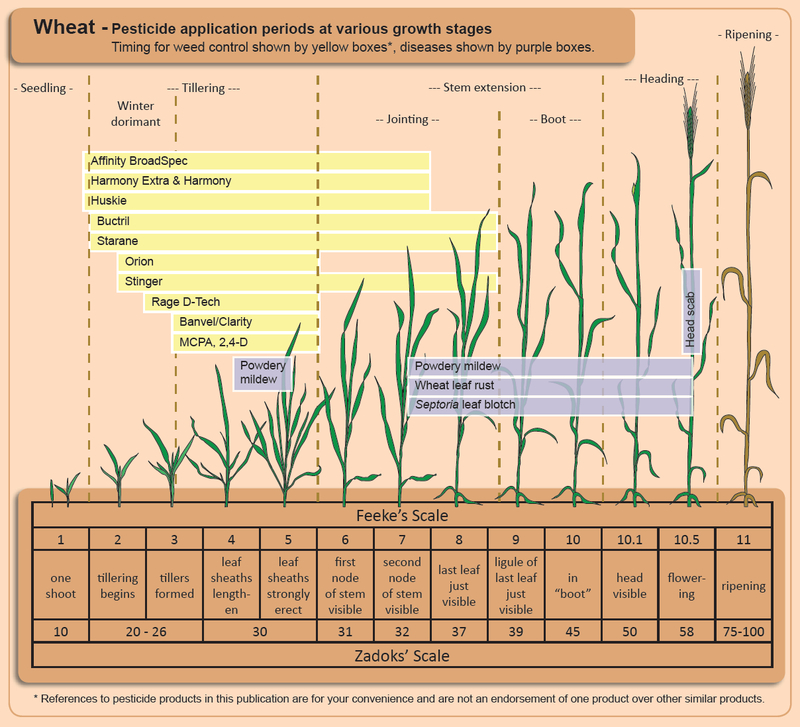 The Fusarium Risk Assessment Tool can be found at http://www.wheatscab.psu.edu. If a decision to apply a fungicide is made, it is important for the crop manager to then consider the proper choice of fungicide. Fungicide tests on wheat are conducted each year in many states east of the Rocky Mountains. These tests are compiled each year and can be found in the accompanying table assembled by the Committee for “Management of Small Grains Diseases”. It is important to note that fungicides containing a strobilurin fungicide are not labeled for control of FHB (head scab). Research has demonstrated that strobilurin fungicides can actually increase DON levels in wheat with FHB. Therefore, always choose a triazole fungicide when targeting FHB. If strobilurin fungicides are to be used to control foliar diseases of wheat, they should be applied prior to the Feekes 8 growth stage. 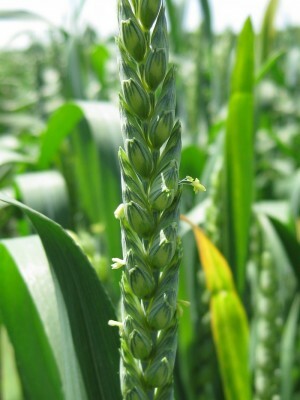 Care should also be taken to manage fungicide resistance development in wheat pathogens. Recently the UW Cooperative Extension publication A3878 – “Fungicide Resistance Management in Corn, Soybean, and Wheat in Wisconsin” was updated. This publication explains how fungicide resistance can occur and actions that should be taken to limit its development. A PDF version can be found at https://ipcm.wisc.edu/download/pubsPM/A3878FungicideResistance.pdf. To view the Fungicide Efficacy Table for Control of Wheat Diseases click here.